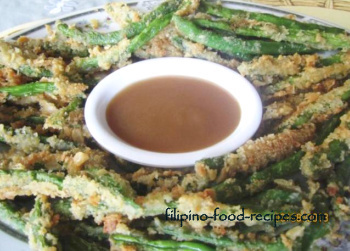 Crispy Baguio Beans, an unusual name for a green beans tempura. 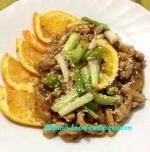 Green beans is more known as baguio beans for the Filipinos, Haricots verts for the French, or sometimes simply referred to as string beans. Unlike a regular vegetable tempura, the green beans has to be blanched to cook briefly before dredging in flour and frying. Blanching is cooking briefly in boiling water and then shocking or submerging in ice bath to stop the cooking process. This is necessary to soften the green beans a bit, so they snaps once you bite into it, rather than be stringy and chewy if you skip this process. Like vegetable tempura, you could dip it in soy sauce and wasabi, or serve with a gravy on the side. This is also a clever way to introduce kids to eat this type of vegetable, though not necessarily healthy. Anything fried and dipped in gravy is always a welcome food choice for kids. 1 Drop the beans in hot boiling water and let cook for 1-2 minutes, then soak in ice water to shock or stop the beans from further cooking. 2 Drain and pat dry with paper towel. 3 Mix the dredge ingredients in a paper bag and shake the beans in it, removing excess flour. 4 Dip in beaten egg and then dredge again in breadcrumbs. 5 Deep fry until breadcrumb coating is golden brown, about 3-5 minutes, then sprinkle with a little salt right off the fryer.